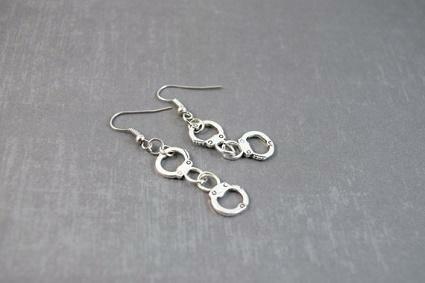 Handcuff earrings are a fun accessory that makes a statement. The earrings can be a whimsical accessory, bold statement or simple fashion choice. These type of earrings appeal to men and women from all walks of life for many different reasons. It all depends on how you wear them! Handcuff earrings and jewelry are popular in goth, punk, biker and scene fashions. The strength, rebellion and sexuality of the handcuff symbol appeals to these fashion movements strongly. Both men and women may wear a pair of earrings or single earring in a handcuff design. These types of earrings appear in novelty shops as well. A person might give these types of earrings for an occasion as a whimsical gift or joke. For example, a woman might wear handcuff jewelry at her bachelorette party when she dances at the bar with the girls. Or some friends might present a woman entering a police academy with handcuff theme earrings to symbolize her future job. During the 1980s, handcuff jewelry was a popular fashion piece for teenagers and young adults who followed pop culture fashion. While the earrings are not as popular with the general public as they were in the era of Michael Jackson's Thriller jacket, Madonna's rubber bracelets or the Flashdance leg warmers, the earrings are still around today in many different styles. Handcuffs symbolize many things from imprisonment to counterculture. Handcuff jewelry is commonly associated with expressions of strength, anti-establishment, isolation or sexual creativity. It some instances, it can symbolize a committed couple if they both wear handcuff symbols. The jewelry can mean different things to each wearer. Wear 14K gold handcuff earrings with a matching 14K gold handcuff necklace as a jewelry set. Dress in a simple black dress and wear sterling silver handcuff earrings as the only jewelry accessory. Create a biker look by adding a single pewter handcuff earring to a simple t-shirt and jeans outfit. Cover hair with a bandanna to complete the look. Pair handcuff earrings with leather pants and a leather corset. The earrings can create a number of different looks depending upon your mood. Fashion Jewelry for Everyone: The Fashion Jewelry for Everyone site offers a silver-plated handcuff jewelry set of earrings and a necklace. Team Zebra: Team Zebra offers a pair of handcuff theme earrings that open and shut. Girl Props: Girl Props has many gold-plated jewelry designs, including a handcuff and gun style. Bling Jewelry: Bling Jewelry sells a variety of jewelry featuring handcuffs. Handcuff jewelry is a versatile type of statement jewelry. It may never be a good Mother's Day gift but the jewelry has an audience. Shoppers can find the right pair of handcuff earrings whether they are looking for a fun novelty piece or an accessory for a leather bustier.